I know I said only three times a week but had to share this with you. Editor in chief said not to but don't worry, she won't know (Actually I put "duck" tape on her computer keyboard so she couldn't edit this) So we are going to do a show for you! We are going to see a performance of Swan Lake now. Grab a cup of coffee. Today's performance of Swan Lake (performed on Goose Pond) is sponsored by Grey Goose! Today's performance of SWAN LAKE on Goose Pond is brought to you by me, Gray Goose!. 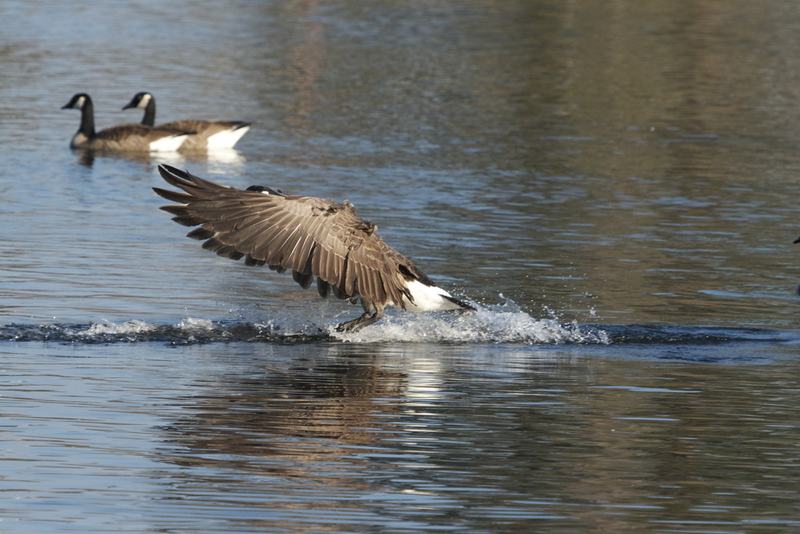 Our Prima Ballerina, the Canada Goose. She bows to the crowd. No you are a silly Goose who thinks she is a Swan! Hey, can I be a swan too? See, I can do those fancy ballet moves too! Oh we do hope you enjoyed our performance! It brought tears to my eyes!. We also hope you will return with us to Goose Pond in the future. Good night. Have a wonderful Weekend. PS No birds were harmed during this performance. Just a few ruffled feathers. 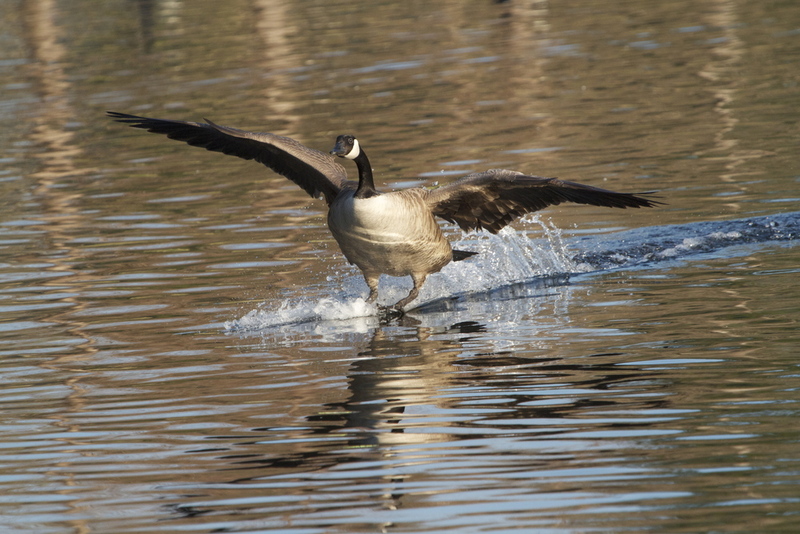 Today I went back to Goose Pond to try and practice birds in flight shooting techniques. The familiar honk of the domestic geese greeted me as they waddled up to the truck to see if I remembered the bread. I went to the opposite side of the pond thinking I could get closer to where the Canada Geese and ducks were landing the day before. The cloud cover made for poor light and photo opportunities but I decided to use the time to improve my skills and wanted to concentrate on the ducks. They were much quicker than the geese and I tried to capture them as best I could in the light. Alas I did not have much luck. Then I had an encounter that still leaves me wondering. As I sat in my folding chair, coffee nearly gone, I noticed a large dark shape against the sky approaching from the west. It looked like a buzzard profile at first with its wings outstretched and soaring. Something was different though. I grabbed my camera and pointed it at the bird, trying to focus as it flew overhead and clicked twice. I recognized it now. It was a Great Bald Eagle, the symbol or our nation. Before I could get off a third shot it I was blocked from my view by a tree. 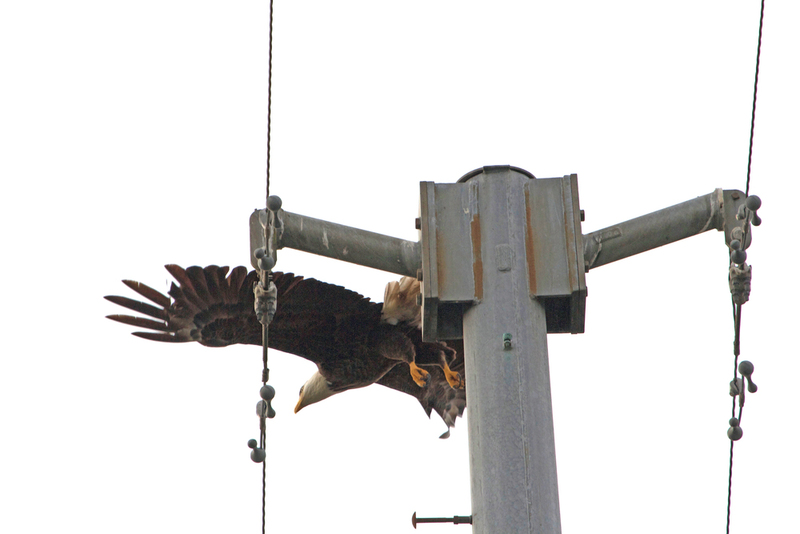 The eagle landed on top of a nearby high voltage power line pole not far away that was running through the area. The eagle was just a dark silhouette against the bright backlit clouds behind it. The symbol of this nation appeared very tired as it perched there, its head bent over as if it had the weight of the world on its once mighty wings. 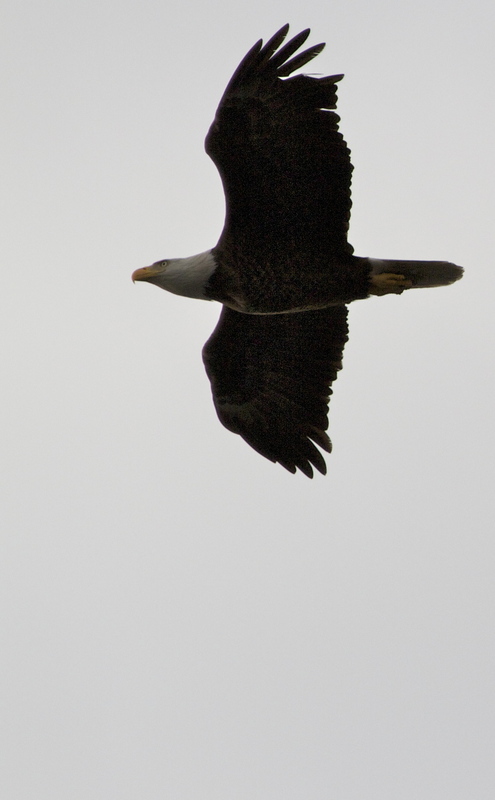 I got up and started walking towards the power lines, hoping the eagle would stay long enough for me to get a photo. As I approached the power lines, the eagle remained still and just stared straight ahead. It became more erect and stood there as if trying to recharge itself from the power lines. It glanced down at me then looked eastward and slowly lifted its wings and slipped off its perch. He still looked tired as he glided away. It was as if the effort was in vain to regain its power. A Bald Eagle silhouettes the sky above me with tattered wings. The Eagle lands on a high voltage power line. He lowers his head as if tired, the weight of the world on its wings. It appears solemn, watching, trying to regain its strength as if it it could tap into the lines. Resolved, it slowly rises and slips its perch. The eagle is still flying. Back on Goose Pond (I told you I would be back). Grab your coffee, let’s look at some more landings. Aviators actually do learn (although some of us ship driver types think it an oxymoron) from observing birds in flight as they maneuver. It teaches them what actions to take to avoid collisions. Here are some close encounters from Goose Pond. There is a honk over my shoulder of an incoming flight of geese. I look up to see them zoom overhead. It looks like one of them hits a bit of clear air turbulence. 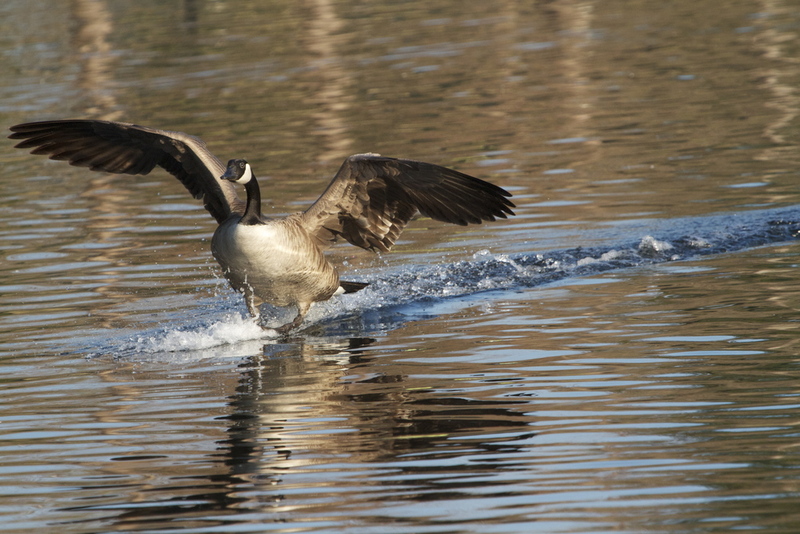 The goose quickly adjusts wing flaps, smooths out, and continues on in. But it was real turbulent there for a moment. A formation of what looks like goose “bombers” come in from the east. Two break off to do what aviators call a section landing, one that they practice hundreds of times. The lead goose goes into a left wing bank, they are a bit too high. They adjust. The wing-bird is now a bit too close to the lead’s tail feather exhaust and they nearly collide. They both apply the airbrakes and the lead bird breaks right and aborts the landing. It was an instinctive maneuver, but it saved them both. 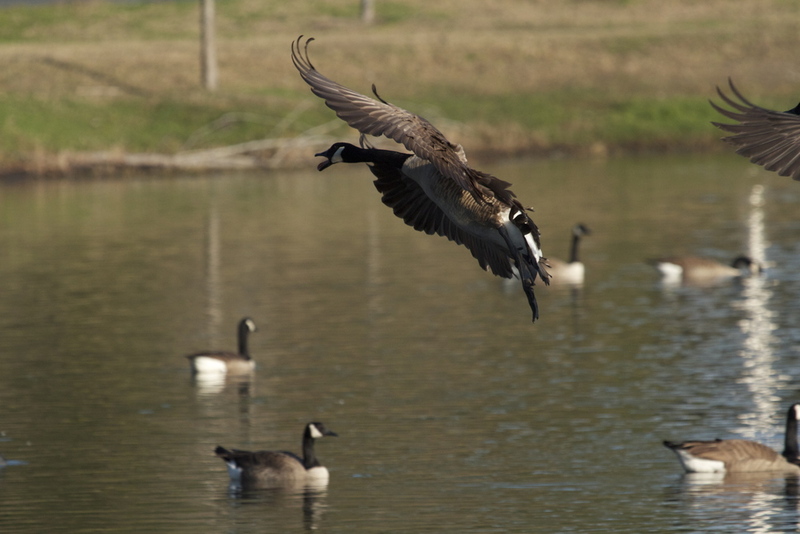 An incoming Canada Goose flies overhead. The goose encounters some turbulence and adjusts..
Ahh, smooth air now! It glides on in. 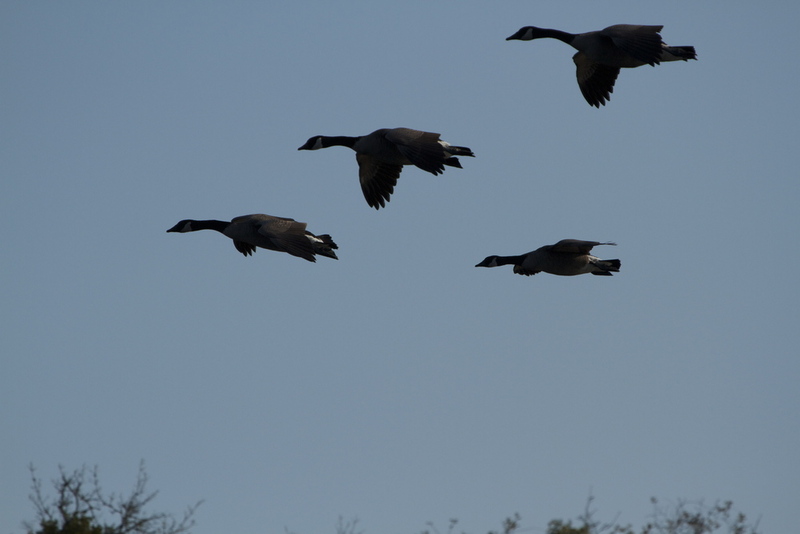 A flight of inbound Canada geese appear like "bombers" returning to the airfield. A pair of geese break off like a section landing. The lead bird begins to slow. 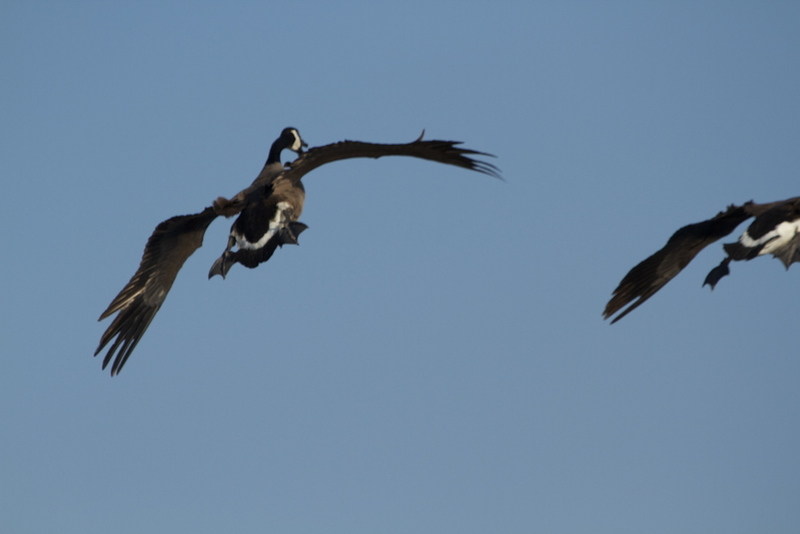 Both geese hit the airbrakes! Lead bird banks right and aborts the landing attempt. Fat Albert comes in for a landing! Goose Pond is a tranquil place to visit. The migratory “snow birds” love it. My editor in chief discovered it and told me about it. It is a man-made retention pond just down the road, about an acre in size and lined with a winding wooded path around it for walking your dogs or just being alone. Bald cypress trees line the banks. It’s a great place to drink a morning cup of coffee. Just watch your step. Geese are known for two things. One is their graceful flight. You can imagine the other. But if you want to practice shooting birds in flight with a camera, this is the place to do it. Using a handheld method to do this takes practice. 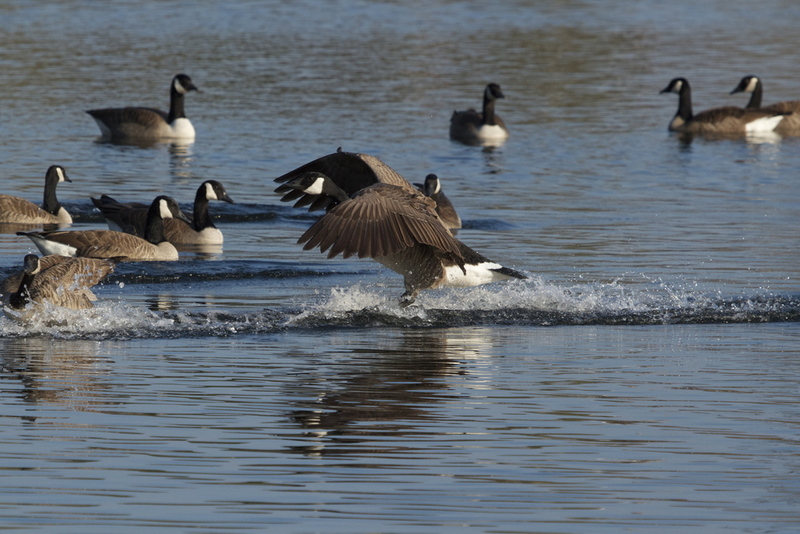 I wanted to catch the moment of the graceful landings of these beautiful Canada Geese. The sky was clear and the morning light was great. The pond is full of Canada Geese, a gaggle of four very large domestic geese (African I think), and assorted ducks of several species. Occasionally I see “fly- bys” of local birds. The domestic geese waddle up and greet me as I get out of the truck. I don't think that they are particularly happy to see me, they are just expecting some bread. Like most geese, the African domestic gander is larger than the goose and has a flap of skin under the chin called a dewlap. With bread in the belly, they loudly honk and then happily waddle away. The African Goose is not from Africa but a variant of the Asiatic domestic goose from Southeast China. According to one source it says “Unofficially, there are two kinds of these domesticated geese: those that hate the world and everything that moves within it, and those which have to be picked up and carried to their shed”. These are clearly closer to the latter. Sitting down on the bank in my folding chair with my thermos of coffee, I begin observing the pond and the movements, waiting to hear that distinct honk of a Canada Goose approaching for landing. 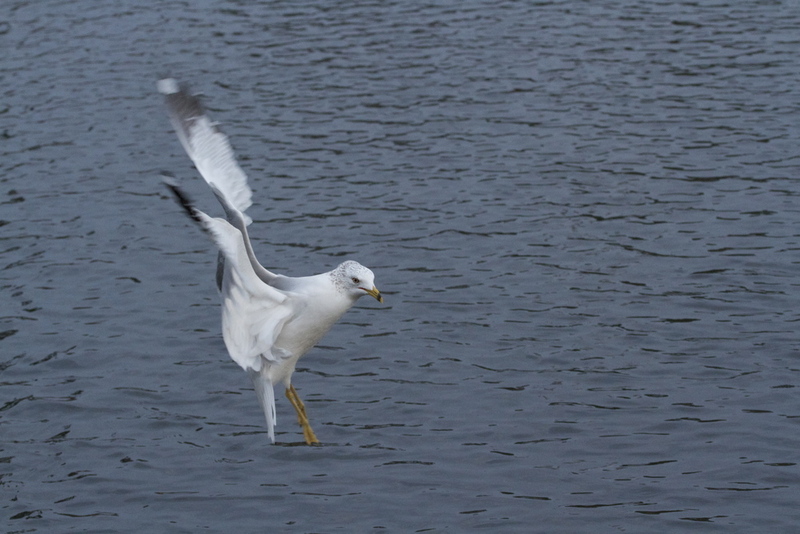 For a while all I see are some seagulls swooping in looking for some more bread. But soon I hear a lone goose honk in the distance. It appears over the trees like an airplane on final approach. Much like patterns at an airport, the goose approaches from one direction and turns to land onto the “waterway” into the wind. I focus my lens on it. 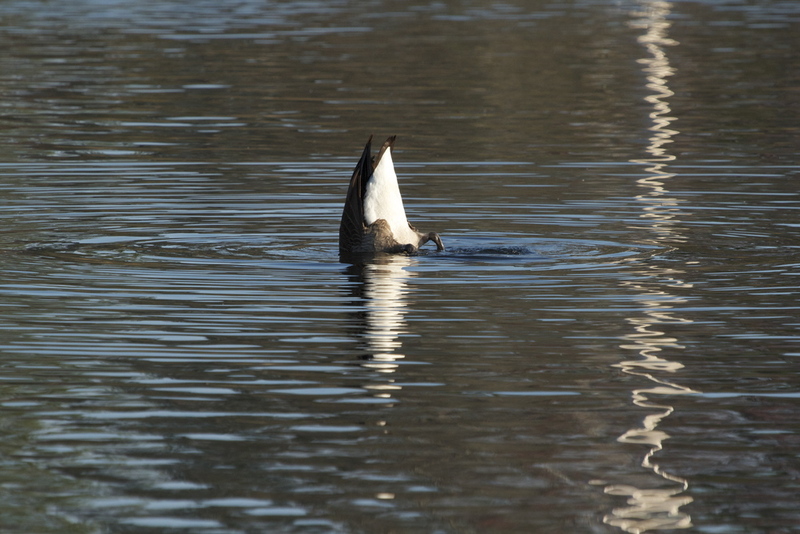 The goose wobbles a bit as it descends and then stretches out its mighty wings. The approach is steady, there is lots of clear “waterway” on which to land. Flaring its huge brown wings like an airbrake, it gracefully touches down. What follows is a loud chorus of honks as friends greet the arrival and everyone just has to say hello. Not all the landings I see are as graceful. One particular goose has a lot of girth if you know what I mean (the term “Plump as a Goose” comes to mind). This one comes down fast, more like a rock, and narrowly misses another. It lands making a huge splash, soaking all those around it. Good thing those goose feathers are waterproof too. Domestic geese (African I think) waddle up to greet me at the "Goose Pond"
Got Bread? A hungry seagull fills my lens. Look out, here I come! A not so graceful attempt. That is all for now, I will be back though!